The attraction of these wines is not in consuming but collecting. These wines sell for exorbitant prices simply because they are rare and that factor appeals to collectors. Most wines do not last more than 50 years, so almost all of these wines are past their date. Image: A view of wines on display at Vinexpo, the world's biggest wine fair, in Bordeaux. 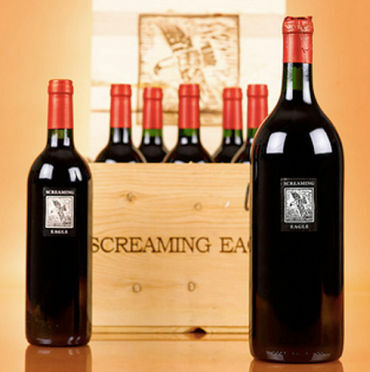 An imperial (six-litre bottle) of Screaming Eagle Cabernet 1992 recorded the highest price paid for a bottle of wine. But, the price should not be counted as it was sold, in 2000, for charitable purposes. Image: Six-litre bottle sold for $500,000. 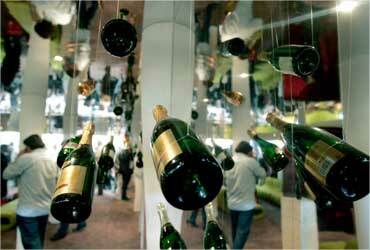 In 1998, two thousand bottles of Champagne were found from a ship that had been hit by German sub during World War I. The bottles have been sold all around the world as an historic collectible item. Image: 2,000 bottles were salvaged from a ship. In 1989, a bottle was estimated to be worth $500,000 by its owner William Sokolin. The bottle from Thomas Jefferson's collection was never tested as a waiter knocked it down in a hotel. 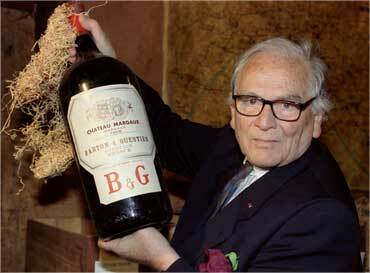 Image: French designer Pierre Cardin presents a four-liter bottle of Chateau Margaux. Publisher Malcolm Forbes paid $160,000 for a bottle of 1787 vintage, which was said to be from late US President Thomas Jefferson's collection and has the initials ThJ etched in the glass. 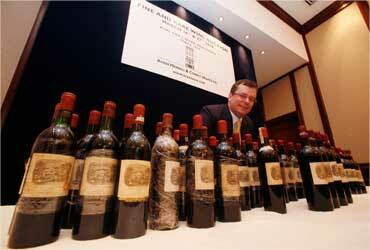 Image: Acker Merrall's president John Kapon poses with a lot of 70 Chateau Lafite Rothschild bottle. This wine is one of only two wines that have been given the Class A status in the Classification of Saint-Emilion wine. A three-litre bottle was bought in San Francisco in 2006 for $135,125 ($33,781 per 750 ml). 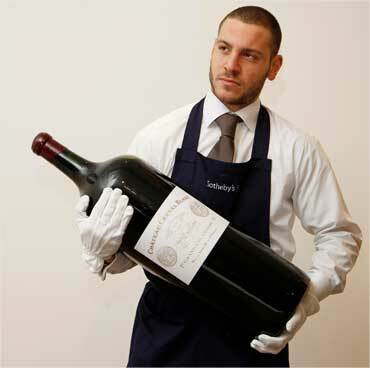 Image: An employee poses with an 18 litre melchior of Chateau Cheval Blanc. In 1997, a jeroboam of Chateau Mouton Rothschild 1945 was bought by a bidder at Christie's, London. 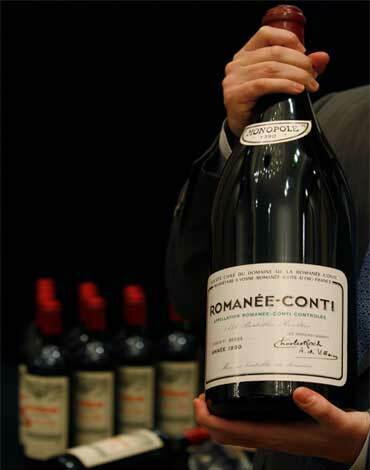 The $114,614 price-tag equates to almost $23,000 per 750ml (a regular-sized wine bottle). 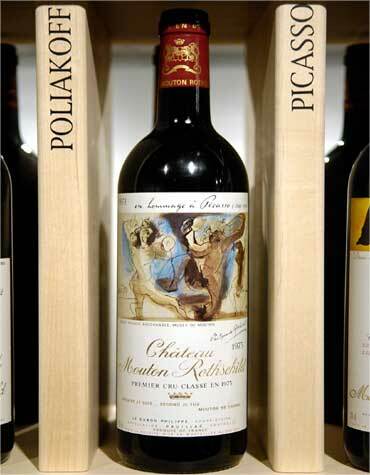 Image: A bottle from Chateau Mouton Rothschild featuring a label by Pablo Picasso. White wine usually sells for less than red, but 1787 vintage Chateau d'Yquem was sold for $100,000 in 2006. Image: View of a Chateau Yquem bottle displayed at the Tour d'Argent restaurant in Paris. 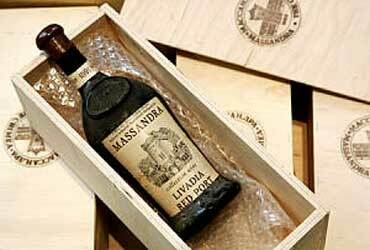 This wine from Russia's Massandra winery sold at an auction for $43,500 at Sotherby's London in 2001. It is said to be the oldest known bottle of sherry in the world. 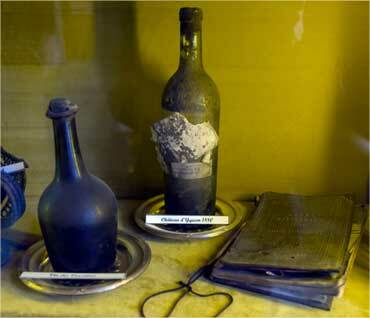 Image: It is the oldest known bottle of sherry. 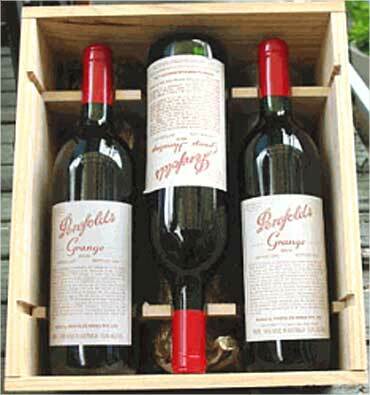 There are reportedly just 20 bottles left of 1951 Penfolds Grange Hermitage today. A collector paid $38,420 at an auction in Australia. Image: There are only 20 bottles left. 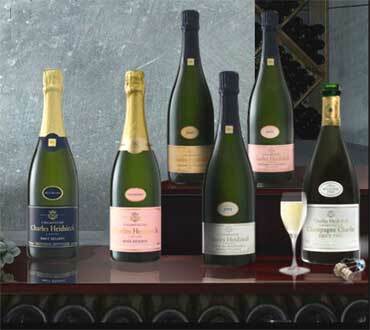 A set of eight bottles fetched $224,900 at auction at Sotheby's London in 1996. Image: DRC Romanee-Conti is shown at news conference.